paper bag & string: Holiday Wishes! It looked like YOU did!!! Ho! Ho! Ho!!! We had more treats than we deserved! I hope your Christmas was purrfect!!! Thank you for your Christmas Wishes Caren, Jan's Funny Farm and Brian! 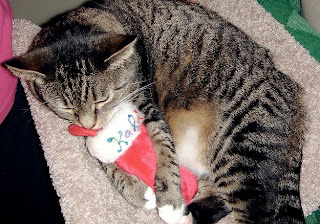 Caren, that's how I felt after Christmas,clutching my stocking after serving 10 people for dinner! Jan's Funny Farm: I did! And bonus: leftovers tonight!